Analyze a simple data processing problem to correctly identify the data and high- level processing involved. A dice rolling game is played with two six-sided dice. A user playing the game will roll the two dice and two random numbers between one and six will be generated. The sum of the two numbers will be used to decide the next step. If the sum is 2,3 or 12 then the player wins. If the sum is 7 or 11 then he/she loses. If the sum is 4, 5, 6, 8, 9 or 10 then the program automatically rolls the dice again until the player wins or loses. After every dice roll, the player will be prompted for an input. The player should decide if the game should continue or not. The amount of games won and lost should also be displayed after every dice roll. 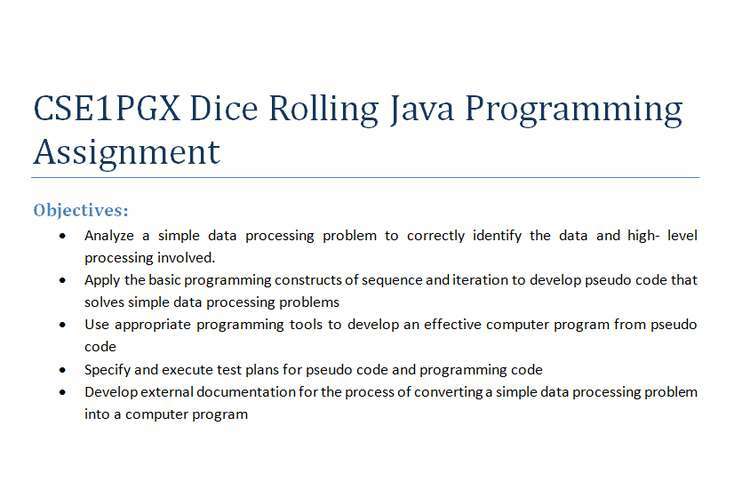 Write a pseudo code to design the dice rolling game. Desk-check the pseudo code using at least two test cases. Provide the test data tables and the desk-check tables. Write a Java programming based on the pseudo code you designed. The program should match the logic specified in the pseudo code. The program code should be easy to read and understand. The program code should be well formatted. The program code should be well commented. This should include comments about the program (i.e. program name, purpose, and author), comments describing each variable and comments on each section of the program. Create an updated test data table to test the Java program. Ensure that program successfully completes all tests.